Crochet House Enjoy Cajun cooking and hospitality with a French speaking family. Crochet House Bed and Breakfast is the perfect place to experience authentic Cajun culture where the French language is still alive; the people, the culture and their roots. Host prepares a delicious full breakfast each morning. 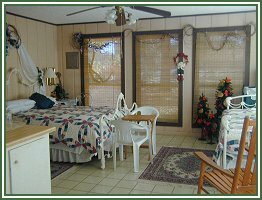 Telephone in room and air conditioning; guest-accessible kitchen facilities; in-room or on-deck coffee service; crib available; children are welcome and pet friendly. In the back yard are swimming pool-jacuzzi, swings and hammocks. Only one hour from the New Orleans Airport and near the Houma Civic Center. The Crochet House, a suburban home is approximately 25 years old, built in the middle of old sugar cane fields. Attractions to explore in the Houma Neighborhood: Swamp tours; wildlife; Plantation; boating and fishing; alligator trappers; antique shops; arts and crafts; downtown marina. Your hosts, Leland and Sally Crochet are lifelong residents of Terrebonne Parish. Both speak Cajun French and they were part of the first generation to speak English in this French speaking community.